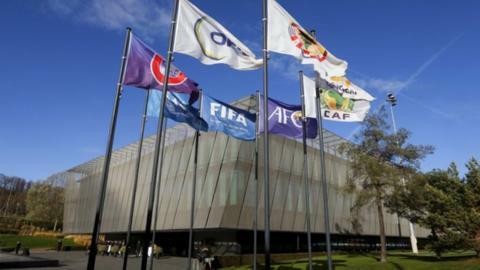 Fifa is considering changing the rules that govern a player's eligibility to represent a national team. At present, players who have played a competitive international for one team cannot switch to another national side. Cape Verde's football federation has proposed this rule be relaxed in cases where a player has played only once or twice for a national side. "There are so many issues that have popped up," said Fifa's Victor Montagliani. "The world is changing." "Immigration is changing. There are nationality issues that pop up all over the world - in Africa, (and) there are issues in Asia and Concacaf. "So it's a good time to have a look at this and see if there are solutions without hurting the integrity of the game." The Canadian, who heads up Fifa's stakeholders' committee, is president of Concacaf, which represented North and Central America as well as the Caribbean federation. Another Fifa rule dictates that players with no blood connection to a country are only allowed to represent it if they have lived and played there for five years. Montagliani said his committee is considering changing that period and possibly increasing it as well. He added that Fifa may also look into a compensation scheme in cases where a player goes through the training system of one country and represents it a youth level before switching to another. In 2004, Antar Yahia made history when becoming the first player to represent one national team at senior level having played for another at youth level. Yahia, who would go on to send Algeria to the 2010 World Cup, had played for France's Under-18 side. Previously, a footballer who had played for one country in a competitive international at both senior and junior level was not permitted to change nationality. The move came following pressure from the Algerian federation.